Popular blogger Luvvie Ajayi (Awesomely Luvvie) tells it like it is and gives voice to a generation that has mastered the perfect side-eye. 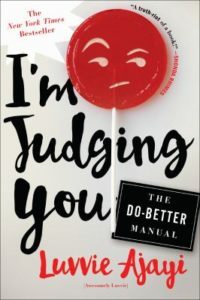 I’m Judging You is a collection of humorous essays that will have you laughing out loud or nodding your head in agreement. Some of the topics she tackles are pop culture, dating, racism, fame, and social media. Growing up in Nigeria and living her adult life in Chicago, Ajayi has a unique view of culture in America, but it will feel familiar to readers all the same. In fact, you’ll likely find that you’ve thought some of the same things to yourself! This is a beautiful collection of essays by one my favorite authors, Ann Patchett. The essays range from a humorous recounting of driving a Winnebago through the Badlands to her sage advice for writers. Patchett’s insights into her own life and the world around her are moving. 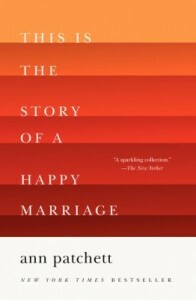 This is a Story of a Happy Marriage is a truly enjoyable read. Letter to My Daughter is a collection of 28 essays on life, faith, motherhood, kindness, and what it means to be human. The pieces are short but are wonderful words of wisdom and insight. I am right with Angelou as she takes on popular culture and our acceptance of obscenity. She calls on us to improve our values to be a people of substance, and to require the same from our elected officials. I found this to be a very thought provoking read. Read the reviews at Amazon.com, watch the author introduce her book, and visit the author’s website. This book of poignant stories show doctors (really, doctors-to-be) to be so human… conflicted, drawn in by the drama of life and death, and constantly learning from the situations they face daily. This is a must read, especially for doctors, others in the medical profession, and for all of us who at some time are their patients. The stories draw you in and make you hope that these medical students remember the “heart” lessons they learned as a medical students at Harvard and that the medical profession works to connect with the human side of their patients. This book is fascinating. Dr. Jerome Groopman, author of How Doctors Think, another of my favorite medical books, does the forward for this book. I have only recently “discovered” the Pulitzer Prize-winning Quindlen. A gifted cultural interpreter, as shown in these essays culled primarily from the New York Times and Newsweek, she gets to the heart of the matter–she articulates the truths– of the contemporary social and political scene. Enjoy—whether you agree or not! Quindlen provides a collection of her Newsweek and New York Times columns offering her opinions and insights into social issues of the day. She divides the book into themes: heart, mind, soul, voice and body. I listened to it on CD and loved it!